In this study, nickel-doped copper ferrite (Cu1−xNixFe2O4 x = 0, 0.2, 0.5, 0.8, 1) nanoparticles (NPs) were synthesized by combustion method using honey as a reducing agent. Cu1−xNixFe2O4NPs were studied by X-ray diffraction (XRD), Fourier transform infrared (FTIR) spectroscopy, scanning transmission electron microscopy (STEM) with energy-dispersive spectroscopy, dielectric technique, ultraviolet–visible (UV–Vis) spectroscopy, photoluminescence (PL) spectra, and a vibrating sample magnetometer, and tested for their antimicrobial activity. In XRD analysis, all compositions show formation of a cubic structure and the lattice constant increased and decreased in the crystallites during doping of nickel with copper ferrite. Furthermore, particle size distribution and morphology of NPs were assessed by STEM. The band gap of NPs can be tuned in the range of 1.6–1.7 eV by varying the dopant concentration. The wide visible emission band is observed throughout the PL spectrum. The hysteresis loop shows ferromagnetism at room temperature. 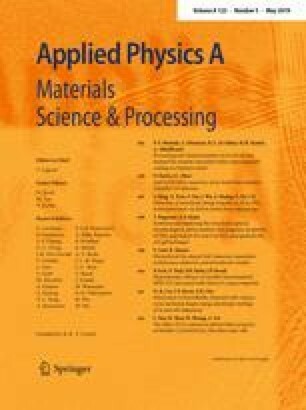 A study of dielectric properties showed that dielectric constant and dielectric loss sharply decreased for all compositions and reached a constant value. The antimicrobial activity of the synthesized NPs was tested against Escherichia coli (G−), Klebsiella pneumonia (G−), Staphylococcus aureus (G+), Bacillus subtilis (G+) and showed excellent results.